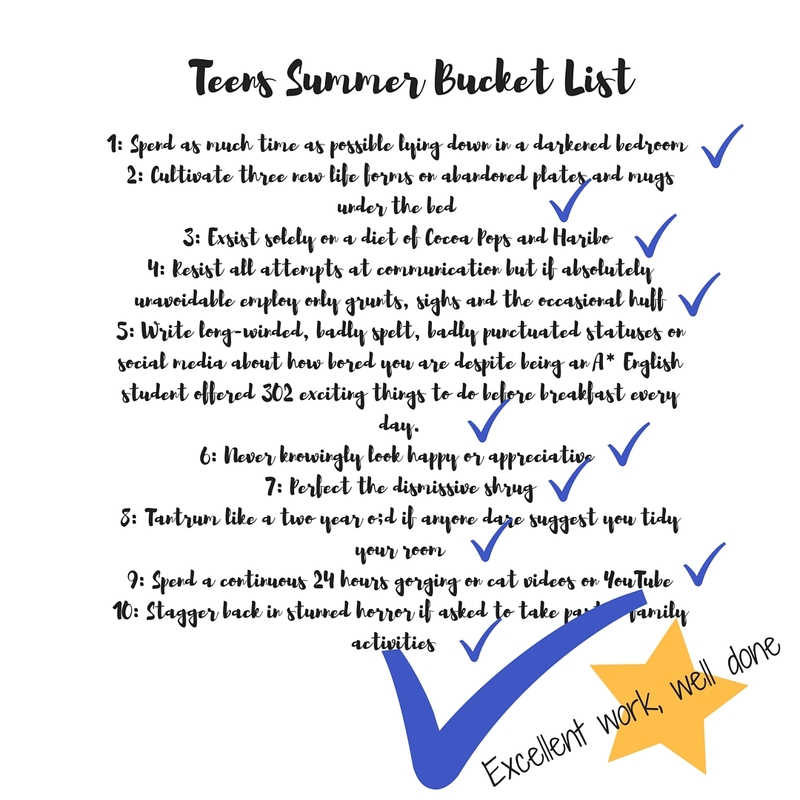 A Quirky Kook: The Realistic Parent of Teens' Summer Bucket List. The Realistic Parent of Teens' Summer Bucket List. 2: Cultivate three new life forms on abandoned plates and mugs under the bed. 3: Exist solely on a diet of Cocoa Pops and Haribo. 4: Resist all attempts at communication but if absolutely unavoidable employ only grunts, sighs and the occasional huff. 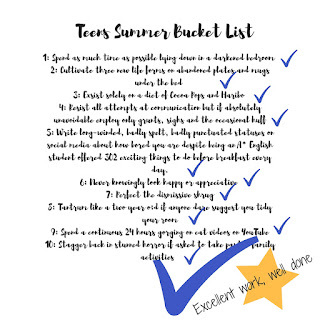 5: Write long-winded, badly spelt, badly punctuated statuses on social media about how bored you are despite being an A* English student offered 302 exciting things to do before breakfast every day. 6: Never knowingly look happy or appreciative. 7: Perfect the dismissive shrug. 8: Tantrum like a two year old if anyone dare suggest you tidy your room. 9: Spend a continuous 24 hours gorging on cat videos on YouTube. 10: Stagger back in stunned horror if asked to join in with family activities. 11: Inadvertently learn Japanese because of the number of dubbed animes you've watched. 12: Communicate with the outside world purely by the use of emojis. 13: Create dirty washing mountain ranges across the panorama of your bedroom and claim they are art homework. 14: Don't sleep for a week. 15: Develop the skin pallor of Gollum. 16: Send incomprehensible Snapchat videos to indicate to friends you are still alive. 18: When running into a family member around the house look at them as if you have no idea who they are. 19: Practise looking down your nose while simultaneously shrugging, sighing and stomping off . 20: Keep the whereabouts of your school PE Kit a mystery until 10.20pm the night before the summer holidays end.